Official - Pato signs - Guus Hiddink challenges him to "show desire". Alexandre Pato finally signed for Chelsea on a loan deal until the end of the season on Friday night and has been immediately challenged by Guus Hiddink to show desire for the game. The signing has divided opinion amongst Chelsea supporters. With the future of Loic Remy to be decided tomorrow, Chelsea would be left with Diego Costa, Pato and Radamel Falcao as our only options available up front between now and the end of the season which has caused concern amongst our supporters. I say it's divided the opinion amongst Chelsea fans because some believe that he is a poor signing, someone who has had his prime and could turn out to be another forward who will struggle with the pace and power of our game. However, there are others like me that believe he has craved the opportunity to have a second crack at playing football in Europe and is proven quality. ‘I am so happy to sign for Chelsea. It is a dream for me. I am looking forward to meeting and getting to know my new team-mates and cannot wait to play. “I want to see that desire in him. If he didn’t have that desire, he wouldn’t have made this step to come to the Premier League. He would have stayed in Brazil and life would have gone on. So this gives him the benefit of some of the doubts from the last few years. I agree it is a brave decision to come to Chelsea and the Premier League. We all agree that our league is the best league in the world, but it's the pace and power of the game that really takes players that come to our country by surprise. 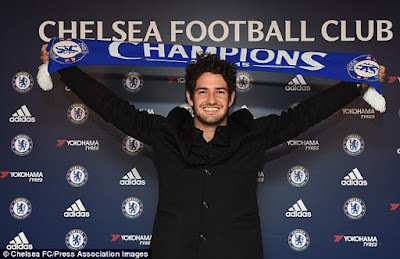 Usually, players are given some time to come in, settle down and get used to it but with the deal only being for six months, it seems that Pato will be given a couple of weeks. I personally believe that he is class and will prove to be an excellent signing for Chelsea. What do you people think of the Pato signing? Is it a good or a bad move in your opinion?